Disa uniflora. Like most disas, D. uniflora has predominant sepals, the petals being partly concealed within the hooded, dorsal sepal. The labellum is a narrow, insignificant strap-like appendage, rather like a gentleman’s neck-tie! The dorsal sepal is usually lighter in colour than the lateral sepals, and lined with red or purple veins. It also has a spur containing nectar, which attracts the orchid’s pollinator, a butterfly called Meneris tulbaghia. The most spectacular species of the genus, D. uniflora grows on the banks of streams, beside pools and on wet cliffs on Table Mountain near Cape Town in the Republic of South Africa. It is often referred to as the ‘Pride of Table Mountain’. But its habitat is not restricted to this mountain, and it is common throughout the west and south-west of Cape Province at altitudes between 100 and 1200 m. Depending upon its location, there are significant differences in colour, shape, size, flower count and stem length. The range of colours extends from red through carmine, pink and orange to a very rare yellow form. In nature, D. uniflora plants usually bear only one or two flowers, but four or five flowers are not unusual in cultivation. In nature, D. uniflora usually grows in poor sandy soils, along with moss and carnivorous plants, such as bladder worts and sundews. The latter favour nutrient-deficient soils, so it follows that in cultivation disas don’t require much fertiliser. Water in the adjacent streams and pools is slightly acidic (pH 4-6) and low in dissolved solids (40 ppm). Melbourne tap water, being particularly soft, is suitable for disas, although rainwater is preferable. Chlorinated water, or water containing high concentrations of dissolved salts, is unsuitable. On Table Mountain D. uniflora flowers in January or February, often in full sun, when midday temperatures range from 27-32°C. Although there is little or no rain at this time of year, the plants flourish because their roots are kept moist by soakage and regular summer fogs provide additional moisture to the leaves. Winter brings wet, cold, stormy weather to Table Mountain, and therefore D. uniflora is easily capable of withstanding a typical Melbourne winter! Its mountain habitat provides D. uniflora with continual air movement, and in cultivation it greatly resents stagnant air. It prefers to be grown outdoors and if grown in a glass-house, continual ventilation must be provided, together with evaporative cooling in warm weather. Disa Cultivation. 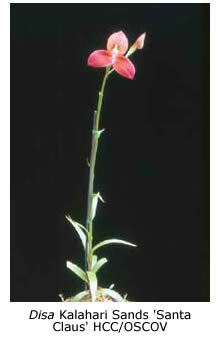 Disa uniflora was first flowered in cultivation in 1843 at the Royal Botanic Gardens in Kew, England. Growers have sought the ideal cultural conditions ever since. In South Africa, disas are grown commercially using coarse silica sand as the potting medium. The plants are irrigated by circulating water to a depth of 25 mm around the pots. Various other potting media have been tested and used by local growers, most of whom have reached the consensus that live Sphagnum moss is the best medium for use in Victoria. My disas are grown in open shade-houses with clear corrugated fibre-glass roofs. Between October and May, the roofs and walls are covered with shade-cloth (nominal 50% shading). For at least ten years I grew my disa plants of flowering size in 100-150 mm pots of Tasmanian Sphagnum moss. The pots were placed in large plastic-lined trays, and watered by filling the trays to a depth of 25-50 mm, using either tap water, or for preference rain water. The water was drained after one or two days, and not replaced until the moss at the top of the pots showed signs of dryness. The period between waterings ranged from 2-20 days, depending on the weather. Under these conditions, both disas and moss grow well, and it is necessary to harvest the moss occasionally to prevent it from smothering the plants. More recently I have grown the plants in a tray through which water containing liquid fertiliser (175 ppm) is circulated continually by a hydroponic-type pump (water depth is approx. 10 mm). This method, used on a very large scale by commercial New Zealand disa grower, Ron Maunder, has the advantage that little or no attention is required for most of the time. Disa Propagation. Disas grow from an underground tuber, in the same way as many Australian terrestrial orchids, but they have no dormant period. The new growth emerges from the base of the old plant in autumn, grows rapidly at first, slows in winter, and accelerates again in spring. Extension of the stem in spring indicates that the plant will flower, usually within a month or two. Additional plants also emerge in spring, often around the rim of the pot and occasionally through the drainage holes. These stoloniferous growths, which arise from the tips of specialised roots called stolons, generally take two years to reach flowering size. During the summer months the main plant develops a new tuber, from which the following season’s flowering plant will develop. After flowering, the main plant gradually dies. In autumn the rhizome linking it to the new plant should be cut, and the old plant removed. Failure to do so may lead to rot spreading from the decaying old plant to the new one. Diseases and Pests. 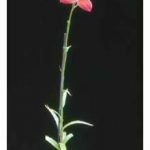 The greatest cause of disa mortality is fungal or bacterial rot, which usually attacks either the crown or the base of the plant. Good culture helps to reduce its incidence. Old black or brown leaves should be removed regularly. Our disas are sprayed two or three times each year, except during the flowering season, with the systemic fungicides Fongarid®, Previcur® or Bavistin®. This procedure helps to reduce the incidence of rot but does not eliminate it entirely. I consider annual losses of 20% to be acceptable, bearing in mind the rapidity with which disas multiply. Annual repotting in fresh moss seems to minimise rot, possibly because Sphagnum moss itself has anti-fungal properties. 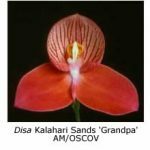 Unlike cymbidiums and many other genera, disas do not seem to be vulnerable to plant viruses. Slugs and snails are not a problem when the tray system of watering is used. Caterpillars can be controlled with Carbaryl dust. I kill aphis infestations with Orthene®; the spray does not affect either buds or flowers. Because of the high humidity due to the damp moss, spider mites (red spider) are no bother. Why Did My Disa Die? After they have killed their first plant or two, many growers become disillusioned with disas. There are three main reasons why these plants died: 1. They were allowed to become dry. 2. They were watered with chlorinated or hard water. 3. They were heavily fertilised. Avoid the above pitfalls and you will find that disas are easy to grow!